William Corel was born April 7, 1828 in Tazewell County, Virginia. William was the ninth child, and second son of William Corel and Rebecca Oney. 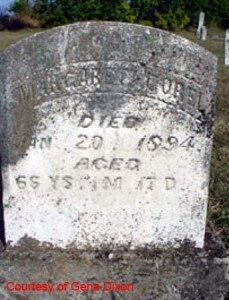 He married Margaret Ann McGee about 1857 in Douglas County, Kansas. Margaret was born December 3, 1827 in Bellefonte Centre County, Pennsylvania. William Corel traveled west with his family from Virginia to Jackson County, Missouri and then on to Douglas County, Kansas. He settled in Douglas County, Kansas in close proximity to his mother, Rebecca Oney Corel, and his brother, James Pickens Corel. In 1863 William Corel sold half of his land to Thomas Sternberg for $500. William andhis young family were still living in Wakarusa Township, Douglas County, Kansas by the 1865 State Census but had moved on to Osage County by the 1870 US Census. It is interesting to note that the land bought by Thomas Sternberg in 1863 was sold to the City of Lawrence for Oak Hill Cemetery for about $3,000. William and Margaret lived out their days in Osage County, Kansas. Lois Tyson, in her 1986 Osage County History, relates that Margaret McGee Corel believed that the name Corel was spelled incorrectly. Margaret convinced her sons to change the spelling to Correll. William and Margaret’s daughter, Ada, did not change the spelling of Corel. 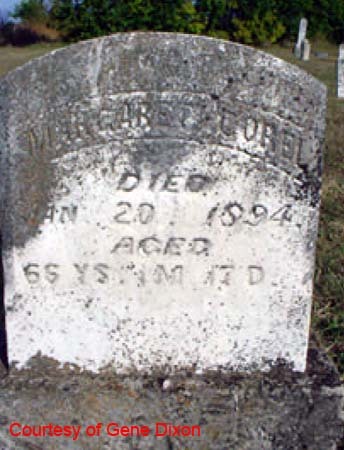 Margaret McGee Corel died on January 20, 1894 in Melvern Township, Osage County, Kansas. She is buried in Sutton Cemetery in Osage County. 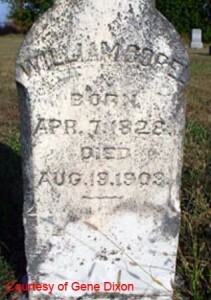 William Corel died on August 19, 1903 in Melvern Township, Kansas and is buried next to his wife, Margaret, in Sutton Cemetery.